(February 3, 2011) --- It will be a clash of epic proportions when the Green Bay Packers square off against the Pittsburgh Steelers for a shot at the Lombardi trophy this Sunday, February VI, MMXI at Cowboys Stadium in Arlington, Texas with a VI:XXV PM (ET) kick-off time. The Packers, who won the Ist II Super Bowls during the MCMLXVI and MCMLXVII seasons, moved into the big game this year after beating the Chicago Bears last month by a score of XXI to XIV in the NFC Championship game. On the other hand, the Steelers will be making their VIIIth Super Sunday appearance with a XXIV to XIX win over the New York Jets just II weeks ago. Green Bay's quarterback Aaron Rodgers is famous for his accuracy, mobility and composure while Pittsburgh's Ben Roethlisberger has a much better offensive assault record and is a QB that has a reputation for making unexpected passes. This year's Super Bowl pits II of the most successful NFL teams against each other. The Packers have won a total of XII NFL Championships while the Steelers have taken home VI Super Bowls titles. The Packers (XIII-VI), who are chasing their IVth Super Bowl title and Ist since the MCMXCVI season, are XXVIII-XVI for a .DCXXXVI winning percentage in the NFL playoffs. 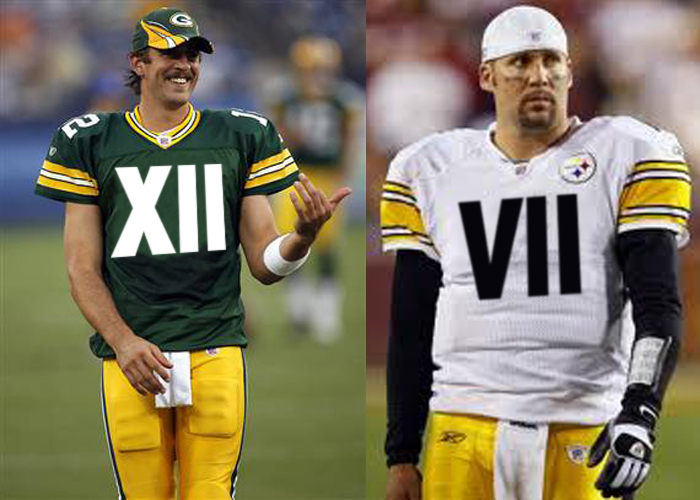 The Steelers (XIV-IV), who are going after their VIIth Super Bowl title and IIIrd in VI seasons, are XXXIII-XIX for a .DCXXXV winning percentage during the postseason. Despite that loss and a slightly better Steelers win-loss record this season, the Packers are favored by II.V points for Super Bowl 45.